If we are still living that old sinful life we lived before our conversion process began, then our souls are desperately in need of being changed for the better (need to be renewed). As mentioned in Paul’s Damascus Road Conversion Revisited, there are two kinds of conversions. There is the initial awakening or converting to the Gospel’s Truths—a turning away from embracing the darkness to embracing the LIGHT. Secondly, there is the successful kind of conversion process, which leads to salvation. However, we need to note here that this successful conversion process does not ALWAYS lead to the Baptism (infilling) of the Holy Spirit. In other words, the successful kind of conversion process happens when our initial “seeing” of the LIGHT is responded to appropriately, in such a way as to activate our faith in Jesus the Christ. This preliminary trusting in the Lord is what causes the Grace of God and the power of the Holy Spirit to regenerate us—to give us our “new” man or “new” woman status, our born again from above rebirth. Our rebirth then leads us to confessing our sins, repenting of our sins, accepting Jesus the Christ as our Lord and Savior, and being water baptized. If, however, we have believed, confessed, accepted, and been water baptized, yet we continue to live unholy and unrighteous lives, then even though we have had the successful kind of conversion process that leads to salvation, we have not received the Baptism (infilling) of the Holy Spirit! For sure, ONLY the Baptism (infilling) of the Holy Spirit can change our souls from the inside out—can change our mind, intellect, emotions, desires, determination, conscience—so that we no longer conform to (become so well-adjusted to) our worldly cultures and societies that we don’t stop to think about how our cultures and societies are affecting who or what receives our undivided attention. Furthermore, only the Baptism (infilling) of the Holy Spirit can change our souls for the better—can focus our minds on God so that we not only swiftly recognize what God wants from us but also quickly respond in godly ways to His Perfect Will. In essence, the Baptism (infilling) of the Holy Spirit gives our “new” man or “new” woman a sound mind (cf. 2 Timothy 1:7)—a mind that focuses on the God-kind of virtues and morals that the Holy Spirit makes known to us—and the Holy Spirit’s infilling gives us the power and authority to live a life that does not habitually sin. 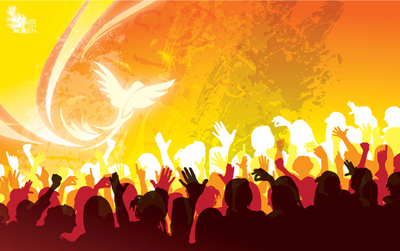 Most believers agree that the Holy Spirit of God is an integral part of every believer’s life—that is, He is an integral part in the lives of everyone who doesn’t just have an initial awakening or an eyes opened only conversion, but also completely continues the conversion process by ultimately becoming a joint-heir with Jesus the Christ. However, what most believers do not understand is that the initial filling AND continual fillings of the Holy Spirit are not automatically given. Bottom line: Being filled with the Holy Spirit is conditional, which means, depending on our relationship with God, we can or cannot be filled! Nevertheless, the Scriptures tell us that in order for us to live a Spirit-filled life, we must allow the Holy Spirit to work with and through us beyond His immediate indwelling. More important, the Scriptures are clear about the difference between being saved and being filled with the Holy Spirit. Indeed, since the Lord commanded His disciples to wait in Jerusalem until they “…receive power when the Holy Spirit has come upon [them]…” (Acts 1:8, ESV; cf. Acts 1:4-5; inserted bracketed word is this blogger’s emphasis), His command makes it obvious that, although the Holy Spirit automatically indwells every born again and saved believer, the Holy Spirit does not automatically infill every believer. Be that as it may; there can be no doubt that Jesus is telling His disciples that the Baptism (infilling) of the Holy Spirit not only brings the fullness of God’s power to each believer but also releases the gifts of the Holy Spirit in every believer’s life so that each believer can be a witness for Jesus the Christ while doing God’s Perfect Will. In fact, the same power that makes it possible for the Lord’s disciples to be His witnesses in this world also enables every Holy Spirit-filled believer to be what God wants him or her to be in this life, as well as makes it possible for every believer to go into eternity as an overcomer. That’s why the infilling of the Spirit is not about our salvation, which results in the Holy Spirit of God immediately dwelling inside of us at the moment we receive salvation. As already mentioned, every person who is a truly born again and saved believer receives the Holy Spirit inside of him or her, BUT the Holy Spirit does not always immediately fill every born again and saved believer! For this reason, since our spiritual rebirth only involves our human spirit being renewed, the challenge then is for us to have our individual soul’s mind renewed, daily. To make sure that our soul’s mind is being renewed daily, Paul tells us that we must continually “…be filled with the Spirit” (Ephesians 5:18b, ESV). Now it should be obvious that Paul is making an important point in Ephesians 5:18, when he presents a contrast between being “drunk” or filled with the Holy Spirit and being “drunk” or filled with wine. His point is that unlike the power of wine, which is only evident when we see the external actions of people who have become intoxicated from alcohol, the infilling power of the Holy Spirit is evident in our internal spiritual relationship with God, Jesus the Christ, and the Holy Spirit AND in our external physical and spiritual deeds that we do for Christ. Paul’s point also is that the external actions of “drunk” individuals become the primary evidence that supports the power of imbibed alcohol. However, even though for people who are “drunk” with the power of the Holy Spirit there also is external evidence, this visible outward evidence is merely the secondary evidence that proves believers INTERNALLY have been indwelt and subsequently infilled by the Holy Spirit. Put differently, the indwelling of the Holy Spirit establishes an internal relationship between the Holy Spirit, God, Jesus the Christ, and the person in whom the Holy Spirit has indwelt. However, unlike with alcohol, the primary evidence that supports the dunamis power of the Holy Spirit’s Baptism (infilling) is a believer’s internal intimate relationship with the Godhead and NOT the evidence that flows outwardly, as a result of that infilled individual’s internal intimate relationship. The outpouring of the Holy Spirit’s inward Baptism (infilling) is external secondary evidence. Once again, external secondary evidence is the result of a believer’s internal relationship with Father God—meaning, how well a believer communicates with God through prayer (cf. Luke 18:1; Romans 12:12; Ephesians 6:18; 1 Thessalonians 5:17), and whether or not any believer has quenched the Holy Spirit, because quenching the Holy Spirit harms a believer’s relationship with God (cf. Ephesians 4:30; Romans 8:23-27; 1 Thessalonians 5:19; 1 Timothy 4:14; 2 Timothy 1:6). Thus, whether or not a believer has an intimate, loving, caring, and obedient relationship with God will determine if that believer also has yielded to the mighty workings of the Holy Spirit and, consequently, received the Baptism (infilling) of the Holy Spirit. The external secondary evidence that supports the power of the infilling Holy Spirit, thus, flows out of a believer ONLY when the surrendered believer is allowing the Holy Spirit to work through him or her so that God can use him or her to minister to others—so that Spirit-filled believer is voluntarily and obediently doing the Perfect Will of God (producing much fruit, a great harvest, for the Kingdom). For these reasons, not only are we to be filled but also continually filled with the Holy Spirit. Indeed, the verses that follow Ephesians 5:18 are those Scriptures that deal specifically with the ways that believers can keep on receiving their Holy Spirit infillings. Each of these ways Paul mentions clearly underscores this biblical Truth: When we repeatedly surrender our lives to the Holy Spirit, He continues to fill us. Bottom line: It is evident in all of the Scriptures that pertain to believers who are full of the Holy Spirit that being filled with the Holy Spirit means surrendering completely to Him by allowing Him the exclusive spiritual occupation of their minds so that He simultaneously can infuse them with God’s Gospel Truth about Jesus the Christ. Additionally, the Scriptures that pertain to believers who are full of the Holy Spirit also prove that the primary purpose of being filled with the Holy Spirit (filled with the power of God’s Gospel Truth) is so that believers can be empowered to become witnesses for Jesus the Christ. Contrary to popular opinions, being filled with the Holy Spirit IS NOT about us receiving a specific amount or “quantity” of the Holy Spirit. Being filled with the Holy Spirit just means that God has chosen and designated His Holy Spirit to be the One who causes us to live a Christ-like lifestyle—God has chosen and designated His Holy Spirit to be the supernatural influencing factor that causes us to do what we do for Jesus the Christ, like witnessing to others, as well as ministering to others, edifying (building up) others, exhorting (encouraging) others, speaking in tongues, prophesying, performing miracles, and so forth. Put differently, God decided that the Holy Spirit would be the One who would transform us into the image of Christ; thus, when we are living Spirit-filled lives—when we are living lives that have been surrendered to the mighty workings of the Holy Spirit—we are living lives that are reflections of the kind of life our Lord lived (cf. John 14:16-17, 26; John 16:8-15; Romans 8:14-17; 1 Corinthians 14:3; 2 Corinthians 3:18; Ephesians 4:4-7, 11-16). Therefore, if we are not experiencing the God-kind of Spirit-filled lives that are producing abundant harvests (if we are not the better “soil” or “heart” into which the Gospel has been sown so that we hearers of the Word can thrive; see the Parable of the Sower in Matthew 13:1-9, 18-23; Mark 4:3-8, 13-20), and if our Spirit-filled lives are not undergoing a supernatural transformation (if we are not being changed into the image of Jesus the Christ, which is verified by how much our lifestyle mirrors or reflects our Lord’s life and His character), then one or both of the following two scenarios might be the reason(s) why. First, it could be that we honestly haven’t been successfully converted, meaning we haven’t received anything from God (His saving Grace and measure of Faith), from the Holy Spirit (His supernatural workings of regeneration, justification, and sanctification), or from Jesus the Christ (His forgiveness from sin and His imputed righteousness). Or, secondly, it could be that we honestly haven’t surrendered our lives totally to Jesus the Christ’s Lordship, a surrendering which would indicate that we have yielded ourselves to His Holy Spirit—the One our Lord tells us God is sending to us for Him to perform mighty works in and through us (cf. John 14:16-17, 26; John 16:8-15). For those believers who are interested, changing these two “haven’t” scenarios from a hasn’t happened status to a done deal would involve surrendering to the complete supernatural workings of the Holy Spirit, including the Holy Spirit’s Baptism (infilling). That is to say, in order for those believers who are not Holy Spirit infilled to receive the Holy Spirit’s infilling, they first must have successfully completed their conversion process in which they genuinely have accepted Jesus the Christ as their Lord and Savior, AND they must have totally submitted (yielded or surrendered) to His Lordship! Lastly, contrary to popular opinions, a Holy Spirit-filled life can be experienced on a daily basis. When all is said and done, a Holy Spirit-filled life always will be an obedient and abiding in Christ life. Therefore, if we truly want to have a Holy Spirit-filled life, then in addition to being born again, saved, Holy Spirit indwelt, and totally submitted (yielded or surrendered) to Jesus the Christ’s Lordship, we daily must show that we love God with all of our heart, mind, and strength; we daily must spend time in prayer and in Bible study; we daily must obey God’s commands; we daily must abide in Christ, and His teachings and sayings must remain in us; and we daily must witness for Christ. Then we can ask what we will of the Lord, even for us to be Holy Spirit filled, and He surely will give to us what we ask (cf. John 15:7)! Have you been born again, saved, and Holy Spirit indwelt? Have you totally surrendered to the Lord Jesus the Christ? Have you been baptized with the purifying fire of the Holy Spirit, as evidenced by the external display of the infilling Holy Spirit’s fullness of life and power (cf. Ephesians 3:19)? If you answered NO to any one of these three questions, then you are not being transformed into the image of Christ, because you are NOT filled with the Holy Spirit! Thank you so much for taking the time to stop by this blog and read this posting. I give God all the praise and all the glory, for everything He has given to me to share here that has enriched your soul, agreed with your Holy Spirit regenerated spirit, and agreed with the Holy Spirit illumined Word of God. Thank you for your comment and for taking the time to stop by this blog. Concerning the image that I posted, I do not own the copyright. Additionally, I do not know who you can contact to obtain the permission to use it.